Browns Bar & Brasserie is located in the heart of Glasgow and; in fact, it’s stand-out address of 1 George Square is one that is hard to forget. A few people had previously told me that they’d had great cocktails in Browns, but I’d not heard a whole lot about the food. Inside, Browns certainly looks the part. It’s a massive space and a traditional-looking bar with modern furnishings scattered throughout. We stopped by around 1.30pm on a Saturday afternoon and it was absolutely packed – surely a good sign? There was a nice, busy ambience in the restaurant and I’m pretty sure we managed to grab the last free table, which was lucky considering that we had no reservation. The last time we visited George Square for a burger was a visit to Jamie’s Italian, which turned out to be not all that great. 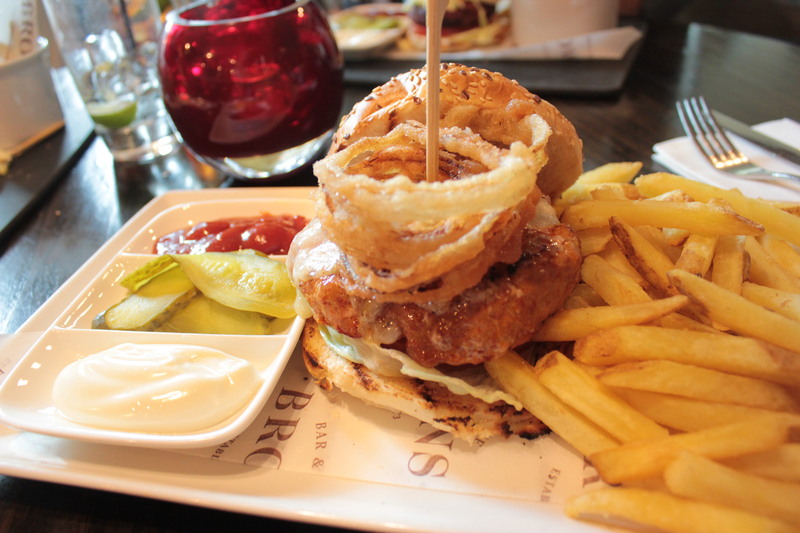 Could Browns Bar & Brasserie top our visit to its next door neighbour and provide a fantastic burger for our latest review? 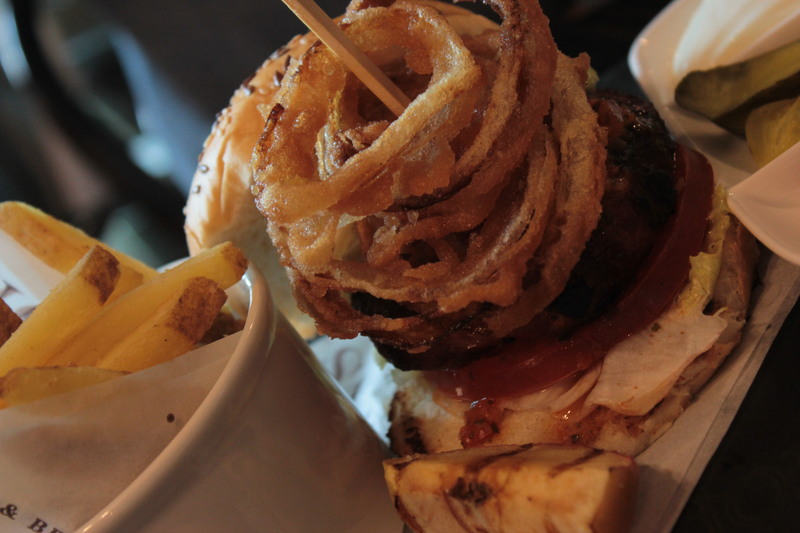 We opted for the Iberico Black Pig Burger and the Wild Boar & Chorizo burger. The Wild Boar & Chorizo burger is detailed on the menu as ‘one thick burger with manchego, pico de gallo salsa and apple & celeriac slaw‘. Well, as you can see from the photos, they certainly weren’t lying when they said the patty was thick! Not only was it thick, it was incredibly juicy and had a lovely, full-bodied flavour with the Manchego cheese really complimenting the smokey chorizo very well. As for the chorizo, it was minced through the patty instead of simply being plonked on top, which is always a good thing. 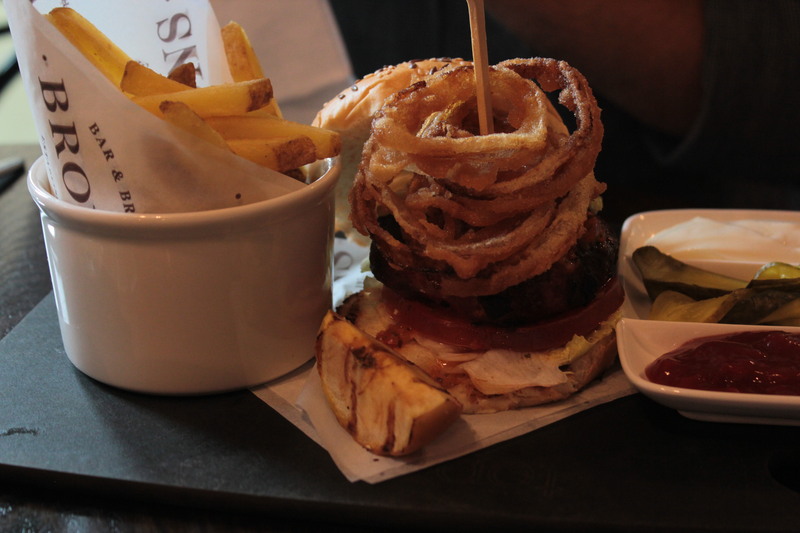 The incredibly thin onion rings that came placed on top of the burger were tasty, but created a lot of mess when left on the bun – we’d advise taking them off and eating them separately. 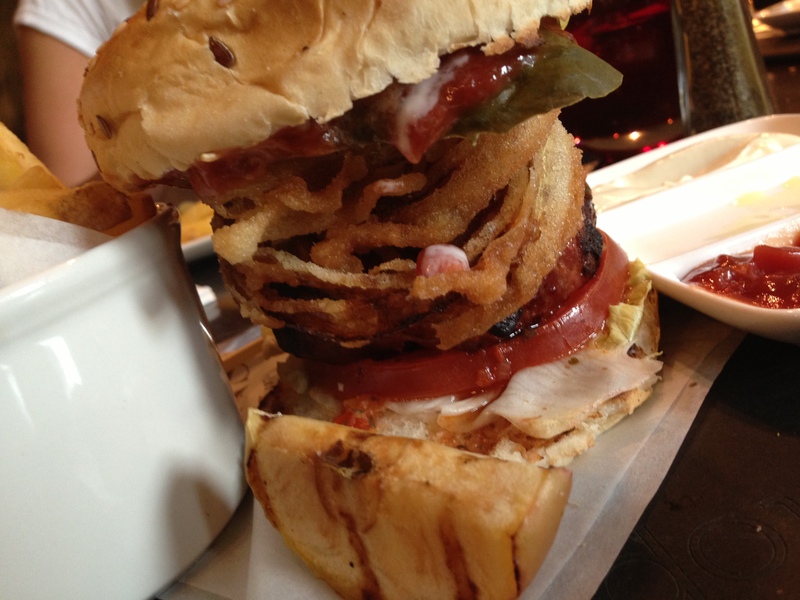 Speaking of mess, this burger certainly provided a lot of it, both in good and bad ways. Good in that the juices from the patty leaked from the bottom of the bun, bad in that the bun itself was very poor and crumbled apart after only a couple of bites. The bottom half in particular had completely disintegrated not long after I’d picked up my burger and taken a bite out of it. It almost felt as if these buns had been previously frozen and then defrosted due to the flakey texture and that they were quite flat in appearance and didn’t hold the contents together well at all. Great patty, nice flavour but let down by a very poor bun. 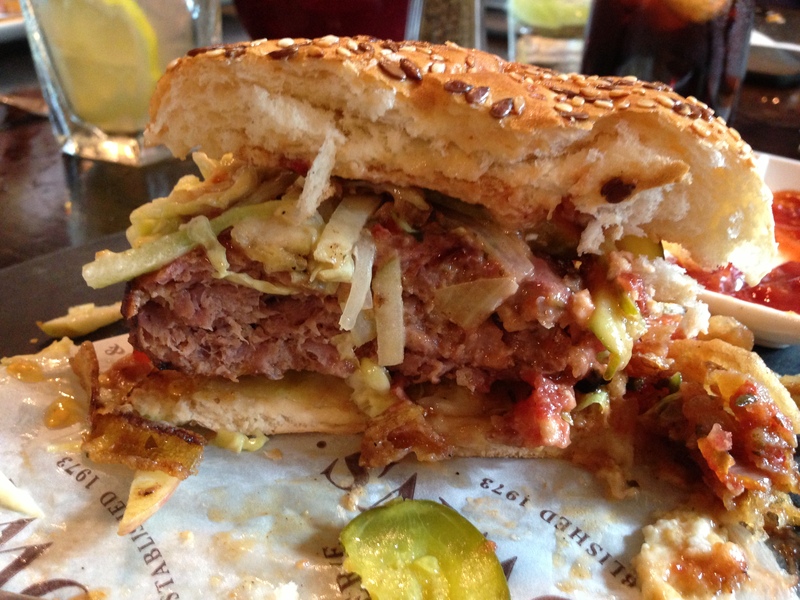 The Iberico Black Pig & Apple burger is described on the menu as ‘one thick burger from this free-range, acorn fed Iberico breed with pico de gallo salsa and apple & celeriac slaw‘. Presentation-wise, this was again stacked with a tower of thin, crispy onion rings that were tasty, but would have been better eaten on the side. I wouldn’t have called the patty thick as it was actually fairly small and paled in comparison to the cheaper wild boar & chorizo burger. Taste-wise, it was fairly bland with the stand out flavour being the relish and gherkins that accompanied the burger rather than the meat itself. The patty was quite tough and overcooked and was nowhere near as juicy or flavoursome as the wild boar & chorizo burger. I was expecting a juicy, melt-in-the-mouth patty with a rich flavour that would rise above everything else that was stuffed into the bun, similar to other Iberico pork burgers that we’ve had previously. Unfortunately, it was not to be. I did; however, very much enjoy the slices of grilled apple that accompanied the burger. It would have better if I could have actually tasted the pork patty – the apple might actually have complimented the flavour. The bun; similar to the wild boar & chorizo burger was extremely poor and didn’t even survive being cut in half when I attempted to half the burger with a knife. The bottom was wet and peeled away like a soggy elastoplast in a swimming pool. Both burgers were served with relish, mayo, gherkins, salad and a portion of fries. The fries were decent, if unspectacular – nothing you won’t have experienced before. At least they weren’t pre-salted, which was nice. 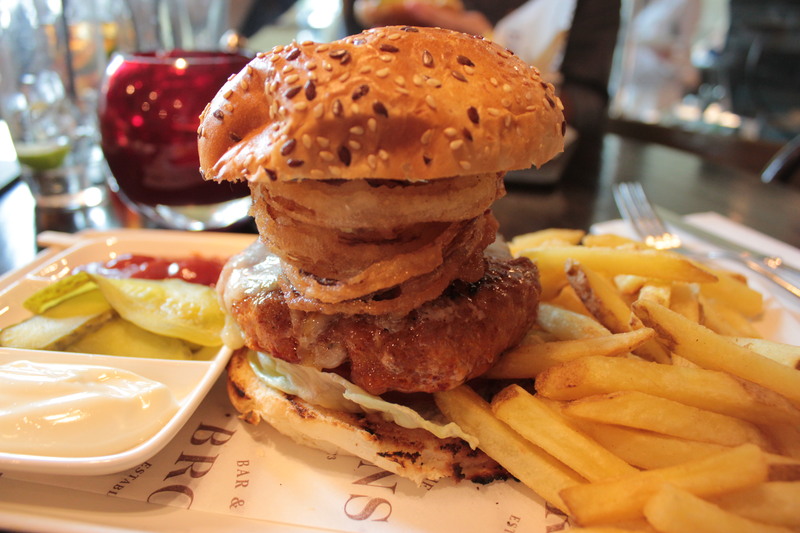 At £14 – £15 per burger, Browns Bar & Brasserie isn’t somewhere I’d be in a hurry to rush back to, despite the fact that the service was friendly and it was at least better than its neighbour, Jamie’s Italian. The Wild Boar & Chorizo patty was very good, but an extremely poor bun made it almost impossible to handle. The Iberico pork patty was bland and overcooked and suffered the same issues in terms of it’s sub-standard bun, which fell apart at the bottom before I’d even taken a bite. While these burgers had some nice touches, especially the boar & chorizo which delivered an excellent, juicy patty, the premium price tag didn’t reflect the overall quality on display.